Owen and Dorothy Lowe founded Autumn Ridge Farm, LLC, Equestrian Park in 2000. Its name comes from its beautiful park like setting in the countryside just north of Winchester, Virginia and from Dorothy's beloved first horse, Autumn, who is stabled on the farm. Autumn Ridge is at the end of a shady country lane, secluded from noise and stress. Worry and tension disappear when you and your horse experience the rolling acreage, beautiful views, and natural setting of Autumn Ridge Farm. The talents and efforts of Owen and Dorothy Lowe make boarding your horse at Autumn Ridge Farm a worry-free experience. Dorothy has cared for horses full time for nearly 15 years and provides the day to day care and handling of all the horses at Autumn Ridge. 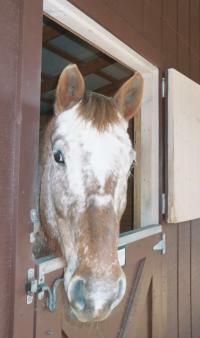 She is certified in horse management and is knowledgeable about both horse care and farm management. She has built and maintained excellent relationships with local veterinarians, farriers, and other equine professionals, which further enhances the farm's ability to care for your horse. Owen enjoys spending time making sure the farm is always safe and well maintained. His background in civil engineering contributed to the design of the farm's exceptional facilities. Since the Lowes live at Autumn Ridge they are able to give the personal individualized care and attention to each horse that is a hallmark of the farm.